Wafer biscuit market in India is still in its infancy stage . Bakery market is still dominated by biscuit and bread categories . 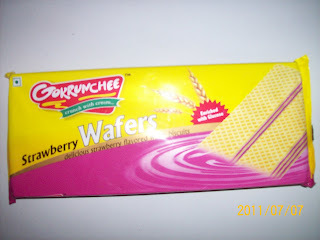 India still do not have pan India wafer brand . We have only one or two brands which are available in malls/supermarket . Dukes and Pick wick . Indian still have to buy imported brands such as Tiffany , Nutro ( Now Britannia ) and Munchees . Gokrunchee is now available in major stores/malls/supermarkets / across major cities . Priced at Rs30/- per 80gms . Promoted by Jayelbee food products of Gujarat .